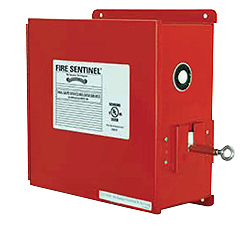 ​​​​​​The Fire Sentinel® is a UL-listed, time-delay door release device that directs a fire door’s closure in an emergency situation. ​​​The adjustable alarm time delay is factory set at 10 seconds but can be adjusted using a dipswitch to change the time for anywhere between 10-60 seconds. The auxiliary 24v DC output can be used to activate additional power devices. The Fire Sentinel comes with back-up power to avoid automatic closure during power failures. It has an ADA sounder/strobe warning before the door closes to alert people that the door is about to close. The fail-to-close safety timer gives you additional assurance of the maxium possible clo​sure. The device will cause the door to stop if there is an obstruction in its pathway. The floor-level trouble indicator provides a visual indication of trouble from the floor. * As defined by NFPA® 80. ** For non-motorized doors, this feature requires a proximity switch. † Available on FSCX models only.